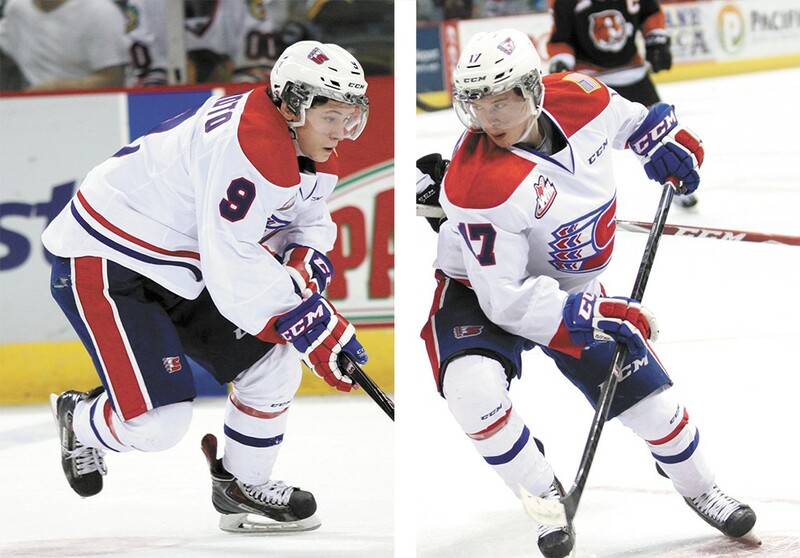 Keanu Yamamoto and his brother, Kailer (right), help anchor the Spokane Chiefs offensive attack. Fans don't need much time to see that Spokane natives Kailer and Keanu Yamamoto are skilled hockey players. They need even less time to see that the Spokane Chiefs employed imaginative fiction writers when listing sizes for the diminutive brothers on the team roster. "They may be giving us a couple inches," Kailer admits with a laugh. "I think I'm 5-(foot-)7¾. Maybe. I'm close to 5-8, but I don't know if I'm there yet. They gave me a couple extra pounds, too." Kailer (pronounced KY-lrr) is listed at 5-9, 160 pounds, Keanu (KEE-nu) at 5-10, 165. Kailer already stands tall in the eyes of National Hockey League scouts, even though he can't be drafted until 2017. "Kailer's getting a lot of looks from some of the NHL people, because he's very, very talented for a young guy," Chiefs coach Don Nachbaur says. Kailer played on U.S. national teams at under-17 and -18 international tournaments the past two summers. He ranked second among Western Hockey League rookies last season, with 23 goals and 57 points in 68 games. Keanu had 12 goals and 29 points in 71 games last season, his second with the Chiefs. Kailer says his older brother "teaches me so much during the season. I probably wouldn't be where I am today without him guiding me along." "He's playing really good right now," Keanu says. "This is the best I've seen him play." Kailer, who just turned 17, leads the Chiefs (3-3-1) with nine assists and 10 points in seven games. Keanu, 19, is tied for fifth with five points (including two goals). Both players are right wingers. The WHL is a rough-and-tumble amateur league for 20-and-under players, almost all of whom have NHL ambitions. Nachbaur, a big, physical player during his days in the NHL, says the Yamamotos succeed at their size because they possess plenty of heart and smarts. "Both guys have done a tremendous job of being aware of where they're at on the ice, using their assets of quickness and change of pace, whether it's laterally or outright speed," Nachbaur says. Kailer adds, "You've definitely got to keep your head up. If it's down in this league, you'll definitely be regretting it in a couple seconds." The brothers learned to play hockey at Eagles Ice-A-Rena but eventually left town to advance their hockey careers in other cities, including two years in Los Angeles immediately prior to joining the Chiefs. The Yamamotos say they enjoyed playing in L.A. and living with a family in the suburbs, but it wasn't Spokane. "It's really nice being at home," Keanu says, "being able to go back to my own bed at the end of the day." Kailer agrees: "I love coming home from a road trip and having my mom's home-cooked meals, and I get to sleep in my own bed." Keanu, a graduate of Mead High School (where Kailer is a junior), considered playing college hockey before he joined the Chiefs in 2013-14. "I decided it would be stupid not to play in my hometown," he says.